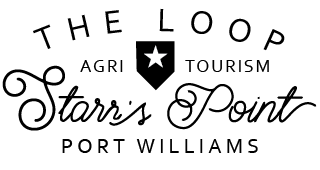 Starr's Point Loop is part of the Village of Port Williams, Nova Scotia. Port Williams is one of the best places on earth to see the vertical rise and fall of the World's Highest Tides. Arriving in Port Williams you will cross a bridge over the Cornwallis River where the water level at high tide can be as much as 16 metres (52 ft.) higher than low tide. Tides happen every 12 hours and 25 minutes (or nearly an hour later each day). All of the experiences within "The Loop" are walking distance or visible of the tide so you can watch one of these seven wonders of the world happen right in your backyard. Bicycle, walk or take a leisurely drive to each of our various experiences on our quiet roads overlooking luscious green fields and the long winding dykes. In the summer and fall, U-picks teem with activity here and at many other locations in the adjacent area. Try some local wine, local cheese, locally brewed beer and join the fun on one of our fun filled farms. Finish your visit with an evening at The Port Pub and a welcoming night's stay at The Planters Barracks.